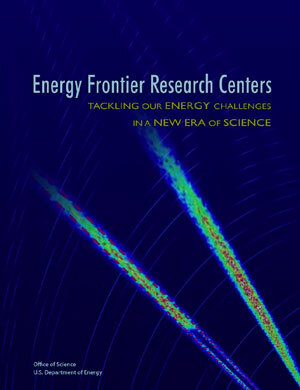 (Nanowerk News) The Department of Energy’s Office of Science, Office of Basic Energy Sciences announces the initiation of Energy Frontier Research Centers (EFRCs) to accelerate the rate of scientific breakthroughs needed to create advanced energy technologies for the 21st century. The EFRCs will pursue the fundamental understanding necessary to meet the global need for abundant, clean, and economical energy. Under this $100 million initiative, universities, national laboratories, nonprofit organizations, and for-profit firms will be invited to compete, singly or in partnerships, to establish an EFRC. DOE anticipates that approximately $100 million will be available for multiple EFRC awards starting in FY 2009. First grant opportunities from $10-25m have been posted in early April. The application process closes on October 1, 2008. Centers will be selected by scientific peer review and funded at $2-5 million per year over a 5-year period. These integrated, multi-investigator Centers will conduct fundamental research focusing on one or more of several “grand challenges” recently identified in major strategic planning efforts by the scientific community. The purpose of these Centers will be to integrate the talents and expertise of leading scientists in a setting designed to accelerate research toward meeting our critical energy challenges. The EFRCs will harness the most basic and advanced discovery research in a concerted effort to establish the scientific foundation for a fundamentally new U.S. energy economy. Here are a few examples of science areas that would respond to the solicitation from the EFRC process. These are intended to be examples only. The intent of the program is to allow for maximum flexibility within the broad guidelines given above. DOE is particularly interested in tapping the imagination and creativity of the scientific community to address the fundamental questions of how nature works and to harness this new knowledge for some of our most critical real-world challenges. Direct conversion of solar energy to electricity and chemical fuels. Learning to direct and control materials and chemical processes at the level of electrons, where the laws of quantum mechanics rule, would pave the way for essentially new quantum control impacting catalysis, photochemistry, molecular biology, and device physics that are the foundational pieces in solar energy conversion. Powerful new methods of nanoscale fabrication, characterization, and simulation—using physical, chemical and biological tools that were not available as few as five years ago—create new opportunities for understanding and manipulating the molecular and electronic pathways of solar energy conversion. Specific areas include coaxing cheap materials for superior performance; new paradigms for solar cell design; photo-catalytic processes for inexpensive, efficient conversion; and bio-inspired methods for self-assembly of molecular components into functional self-regulating, and self-repairing systems for solar fuel production. Understanding of how biological feedstocks are converted into portable fuels. Biological systems are the proof-of-concept for what can physically be achieved by nanotechnology. Consider the ease with which biological systems transform and store energy or their ability to self-repair and to adapt to changing external conditions. The way in which energy, entropy, and information are manipulated within the nanosytems of life provides us with lessons on what we must learn in order to develop similarly sophisticated energy technologies. This entails research in light harvesting, exciton transfer, charge separation, transfer of reductant to carbon dioxide as well as carbon fixation and storage. Specific areas might include molecular-scale characterization of the physical structure and chemical properties of plant cell wall materials with the aim of circumventing the need for extensive pre-treatment and biological hydrolysis to sugars (saccharification), which are current bottlenecks in cellulosic biofuel production. Other areas include development of new and improved catalytic conversion processes that are far more robust than enzymatic systems for the conversion of plant polymers to fuels. A new generation of radiation-tolerant materials and chemical separation processes for fission applications. By designing and perfecting atom- and energy-efficient synthesis, one can create a paradigm shift in the discovery and design of new chemical assemblies and materials that are mechanical strong; light weight; and resistant to corrosion, decay, or failure in extreme conditions of temperature, pressure, radiation, or chemical exposures encountered in fission applications. Key research includes: foundational research in chemistry and physics of actinides and their fission products; new generation of actinide separations processes with improved efficiency, selectivity, cost-effectiveness, and waste minimization; first-principles design and understanding of materials with improved radiation and corrosion resistance at elevated temperatures; microstructural design and predictive models for mitigating long-time degradation behavior; characterization, theory, and computer models for decades-to-centuries performance; and solution and interfacial behavior under extreme radiation flux and elevated temperatures. Addressing fundamental knowledge gaps in energy storage. Without effective electrical energy storage, renewable—yet intermittent—sources of energy such as wind and solar will not be able to significantly displace fossil, nuclear, and other conventional energy sources used for generating electricity for the power grid. Similarly, current battery technologies are limited, making plug-in hybrid or all-electric cars prohibitively costly and insufficient to meet consumer demands. Long-term, fundamental research in electrical energy storage will be needed to accelerate the pace of scientific discoveries and to see transformational advances that bridge the gaps in cost and performance, separating the current technologies and those required for future utility and transportation needs. For example, by mastering energy balance on the nanoscale through harvesting the large number of forces that are often operating simultaneously, such as electrostatic attraction and repulsion, chemical bonding, surface tension, and random forces from environmental fluctuations, a wide variety of structures can be assembled for 3-D architectures with multi-functionalities in energy storage unsurpassed by any given existing technologies. Other research areas include new capabilities to “observe” the dynamic composition and structure of the constituents in the electrochemical storage systems; novel electrolytes with high conductivity over a broad temperature range and long-term stability; and theory, modeling, and simulation that integrate methods at different time and length scales. Transforming energy utilization and transmission. At the heart of the nanoscale behavior, one often finds emergent phenomena, in which a complex outcome emerges from the correlated interactions of many simple constituents. By understanding the fundamental rules of correlations and emergence and then by learning how to control them, we could produce, for example, an entirely new generation of energy utilization and transmission processes, such as in phase change materials for thermal energy conversion, strong light-matter interaction and collective charge behavior for light emission nearing theoretical efficiency, and radically different combustion chemistry of alternative fuels. Understanding the emergent behavior of materials and chemical reactivity at the nanoscale offers remarkable opportunities in broad arena of applications including solid-state lighting, electrical generators, clean and efficient combustion of 21st century transportation fuels, catalytic processes for efficient production and utilization of chemical fuels, and superconductivity for resistance-less electricity transmission. Science-based geological carbon sequestration. All natural and most human-induced phenomena occur in systems that are away from the equilibrium in which the system would not change with time. If we can understand system effects that take place away—especially very far away—from equilibrium and learn to control them, it could yield dramatic new carbon capture technologies and enable new strategies for sequestering carbon to mitigate environmental damage. Key research areas involve new membranes and separations of carbon dioxide from process streams at high temperature and pressure; understanding geochemical processes relevant to the dimensions of subsurface sequestration sites with realistic geological formations chemistry; developing critical geophysical measurement techniques for remote probing and tracking; developing fluid-flow measurement approaches and simulation tools that can link chemical and physical processes at multiple scales; and advanced measurement and modeling verification at field sites. A number of EFRC awards will be initiated in FY 2009 based on an open competition among academic institutions, DOE laboratories, for-profit entities, and nonprofit organizations. Research activities may be sited singly at a specific institution or in multiple locations through collaborations between institutions. The EFRC awards are expected to be in the $2–5 million range annually for an initial 5-year period. A Funding Opportunity Announcement has been issued that requests applications from the scientific community for the establishment of the initial suite of EFRCs. It is anticipated that approximately $100 million will be available for multiple EFRC awards. As the EFRC program matures, it is anticipated that EFRC competitions will be held every 2 or 3 years and that renewal submissions will be openly competed with new submissions. Out-year funding is subject to satisfactory progress in the research and the availability of funding appropriations. While capital investment in instrumentation and infrastructure are expected as part of the EFRC awards, usage and leverage of existing facilities, including the BES user facilities, is encouraged.